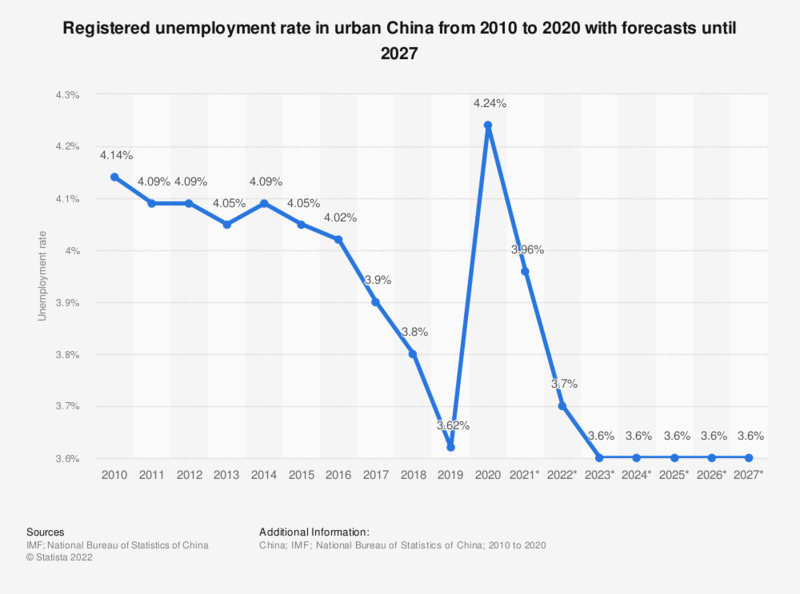 The statistic shows the unemployment rate for China from 2012 to 2017, with projections up until 2023. In 2012, China's unemployment rate ranged at about 4.09 percent. From the statistic at hand one can see that the unemployment rate in China has been fairly constant at around four percent over the last few years. This may be partly explained by the fact that due to its socialist heritage, full employment policy historically has played a major role in economic considerations of the Chinese government. Another possible explanation may be found in the index’s methodology, which, according to the National Bureau of Statistics, gathers only employment data for urban regions. The debate as to whether to adjust the methodology accordingly in order to create a more accurate statistical image is still ongoing among Chinese politicians and statisticians. A main concern in China’s current state of employment lies within the still large regional differences. As of 2016, the unemployment rate in more central and western regions of China was notably higher than in China’s eastern parts. In Beijing, China’s political and cultural center, unemployment ranged at merely 1.4 percent for 2016. Youth unemployment is also apparent in China, but with its own characteristics. Young people with higher education are more likely to have difficulty finding a job, according to the China Household Finance Survey. One reason for this might lie in the enrollment expansion since 1999. The number of newly enrolled students in public universities skyrocketed from around 2.7 million in 2001 to roughly 7.5 million in 2016. Apart from the unemployment rate, most commonly used indicators to measure economic activities of a country are GDP growth and inflation rate. According to an IMF forecast, GDP growth in China will slow down to about 6.3 percent in 2019, depicting a four-percent decrease from 10.61 percent in 2010. This estimate is backed up by quarterly growth data published by the NBS, which recently reported 1.4 percent GDP growth for the first quarter of 2018.